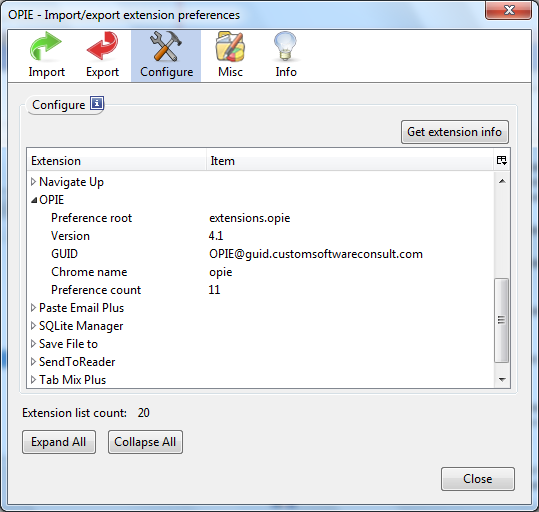 OPIE is a Firefox extension that allows you to import and export your installed extension preferences. This is useful when installing extensions in a new profile, or synchronizing multiple Firefox installations. If all these preference checks fail, the user can manually assign a "preference root" that identifies the preferences belonging to a particular extension. Sometimes this preference root can be guessed by examining the items in "about:config", otherwise the extension developer can supply this information. OPIE v5.0 now extracts the preference list from defaults/preferences. If the extension does not have its preferences stored there, they cannot be exported. The Import window has two buttons and two textareas. The "Browse" button brings up a file picker window. 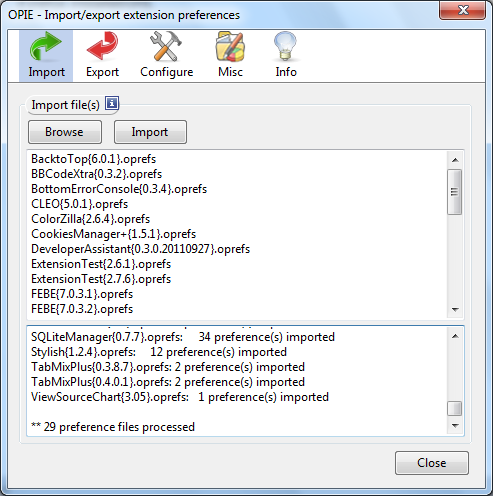 Here you may select one or more exported preference files that were previously created with the OPIE export function. Double click to open a single file. Multiple files can be opened using the SHIFT-CLICK and CTRL-CLICK methods. The top textarea will display the selected files. Clicking the "Import" button will import the selected preferences and display the results in the bottom textarea. Click the "Browse" button to select a directory where the exported preferences will be stored. This directory is also the default location for importing preferences. The "Get list" button retrieves a list of all extensions that OPIE knows about (see Configure). 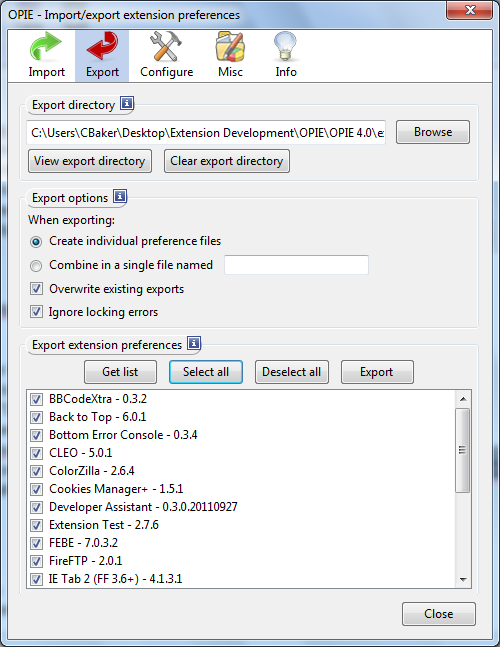 This list is displayed in the textarea along with checkboxes to select which extension preferences to export. "Select all" and "Deselect all" buttons do what is implied. Clicking "Export" will create the individual preference files. 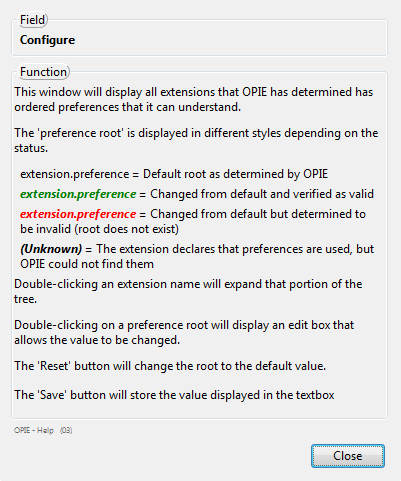 This window will display all extensions that OPIE has determined has ordered preferences that it can understand. Please report problems in the support forum. Removed 'Configure' pane. Extension preferences are now taken from defaults/preferences automatically. User no longer has to determine the preference root. Fix for Boolean prefs always importing as "false"
Please help get this extension out of the AMO sandbox! If you find this extension useful, please consider posting a favorable review on the AMO page. I'd like to publish a FEBE/CLEO/OPIE package but with OPIE languishing in the deep, dark recesses of AMO netherland, few users will see or know about it. Same as beta3b but with el-GR locale. This is the first official release. Beta version - bugs possible (though it works just fine for me). Be sure to backup your preferences (prefs.js) just in case!